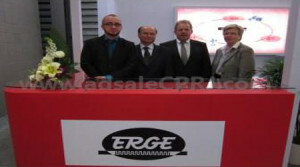 Heimo Messer, Managing Director of Erge, believed that ceramic heater will still be the best solution for plastics industry in the foreseeable future. Erge Elektrowaermetechnik GmbH is a specialist for electrical heating of machines, molds and tools who invented the ceramic heater. “Induction heating is too expensive and not practical. Maybe its ok for some special solutions, but not for mass production,” notes Mr. Messer. A lot of Chinese manufacturers are still using mica heaters, he said, but with the increasing demand in quality, will sooner or later turn to ceramic heaters, and that is where Erge will benefit from. Mr. Messer added that Chinese plastics machinery sector will enter a phrase of consolidation, in which small and low quality companies will disappear. The business was good in 2013 and it is still growing this year, according to Mr. Messer, who is expecting a 5-8% growth rate because “for Original Equipment Manufacturer (OEM) like us, the market is growing but not so big”.